Playing online bridge in BBO the other day I was impressed that my partner made the right decisions in this game. South was the dealer and passed. The first big decision my partner had was to bid or not to bid. • It meets the “Rule of 20”. Adding the number of high card points to the lengths of the two longest suits totals 20 or more. • The points are working. They are consolidated in the long suits, not scattered nor in singletons. • It’s Spades, stupid. Will prevent the opponents bidding a suit at the 1 level. Partner, who is an aggressive guy (and not only in Bridge), did indeed open 1 Spade, and became declarer when the bidding went to 4 Spades. Thinking about losing tricks immediately, as you should, declarer saw the nice AK of Hearts opposite his singleton, but unfortunately it was no longer possible to throw a loser as the opponents had already got their Diamond trick. Similarly there is nothing worthwhile to throw away from the table on clubs. After the Ace of Diamonds won, North played the King which declarer ruffed. Declarer then lead a small club which not only unblocked the club suit but allowed him to lead a Spade to his KQ next. North took the Queen with the Ace of Spades and lead a Heart. The second big decision declarer had was whether to play the Jack of Hearts or not. Which was linked to the next decision whether to develop tricks in Hearts or Clubs. The two suits are almost identical both with seven cards between the hands and containing AKJ. Speaking for Hearts was the possibility to finesse the Queen as was offered now, and with AK in the same hand, no need to go “Hin und Her” to set up the suit. Speaking for Clubs was that the ruffs will happen in the hand short in trumps, a Good Thing. Also that the long suit is in declarer’s hand not on the table, so easier to access once the dust has settled from drawing trumps and establishing the suit. My partner took the right decision to play on Clubs. He played the Ace of hearts and lead another Spade to his King which dropped the Jack in the North hand. He then played the Ace of Clubs, was pleased to see the Queen drop, then lead another club which he ruffed in dummy and South over-ruffed with the opponents’ last trump. The defenders now had 3 tricks but nowhere to go to get the contract down. 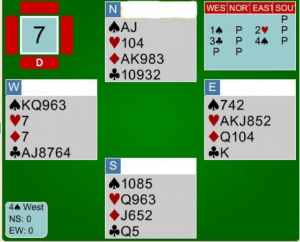 Whatever South leads, declarer can ruff in hand and play the Jack of clubs to take North’s remaining club the 10. Declarer’s last two clubs and the last trump take the last tricks. My partner decided to torment the opponents a bit longer though because he’s that sort of person. When South lead a Diamond he did not ruff but won with the Queen on the table, played the King of Hearts and only then ruffed in hand to pull the last club and claim. The good score rewarded his good decisions. Looking at the results of the other players, only one other pair made 4 Spades, three pairs went 2 down and one went 3 down. Others went down in 3 No Trumps or 4 Hearts. “Well played partner”, I typed in Chat. But he was already busy thinking about beating up the opponents in the next hand.